The bridge at Cascade Locks is a classical old bridge. The bridge was about 50 yards from our hotel on the Columbia River. So naturally, I wondered over early one morning to take some photos of the bridge and the fog over the river. 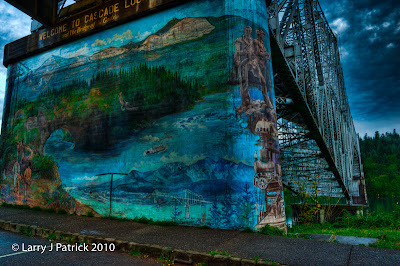 After trying various angles, I finally decided to take one of the bridge pilings with its Lewis and Clark mural on it. While I was taking the photo, I kept thinking about a comment that many of our judges at Bay Area Photo Club make: “It’s not your art if you are merely taking a photo of someone else’s art.” So based upon that theory, only the far right side of my photo is my art. But then again, the design of the bridge someone else’s art. So, I guess that portion of my photo cannot be considered my art. Then, again, the sky and the trees—they are God’s art so I guess that portion of the photo cannot be mine. Well, it may not be much of the photo, but you must admit, the sidewalk represents truly fine art that is all mine. Camera settings: Nikon D3, Nikon 28-70mm f/2.8 at shot at 28mm, ISO 200, f/11 and 1/60th of a second. Lightroom 3—Set black and white points, added clarity, vibrance and mid-tone contrast. Photoshop CS5—removed a few distracting elements within the photo and use nik Color Efex Pro tonal contrast to bring out details. Photo seems a little dark. I wish it was a little brighter so that I could see more of the details. I cannot see why any photo you take is not your art. The photo could be good but it is too dark and needs more of the environment to put it within context. I wish there was more to the photo than there is. It seems a little flat.